PPID, short for Pituitary Pars Intermedia Dysfunction (formerly called Equine Cushing's Disease), should be considered for any horse with laminitis, particularly if the horse is aged 10 or older or if laminitis occurs in the autumn. Diagnosis of PPID should be made on the history, clinical signs and blood tests. PPID is treated with a daily dose of pergolide, available as Prascend or compounded pergolide (depending on country). 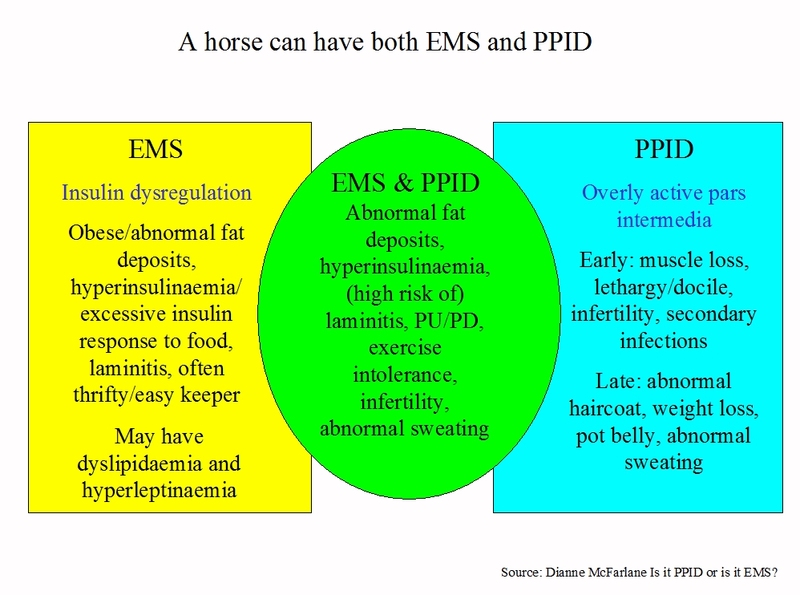 NB a horse can have EMS and PPID. Early signs of PPID are often variable and subtle and can be considered "normal" signs of aging - see Video comparing PPID symptoms and normal aging. Horses may show only one, or any combination, of the clinical signs of PPID. Symptoms vary considerably between different horses, at different stages of the disease, and at different times of the year. PPID is a progressive degenerative disease, meaning that symptoms are likely to increase and worsen with time if the disease is not treated. 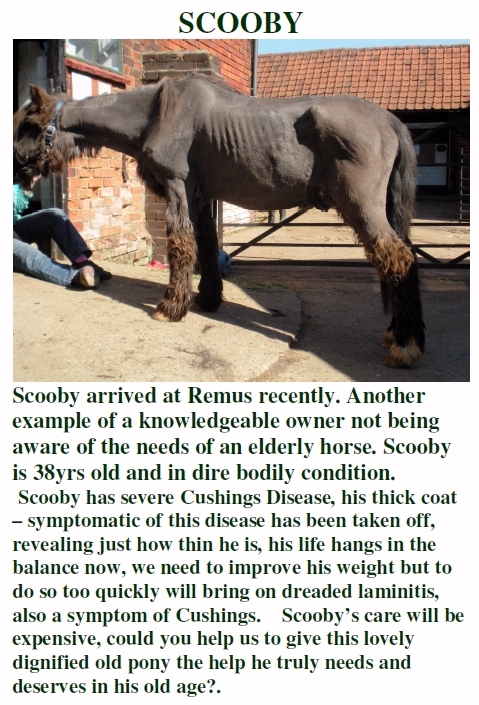 Early recognition of the symptoms leading to diagnosis and starting treatment can increase both the quality of life and the life expectancy of the horse. Decreased athletic performance → lethargy (horse often described as "increasingly lazy"). Change in attitude/behaviour - usually becoming more docile but some horses become more stressed/excitable. See Behavioural Abnormalities p 100. Delayed or patchy coat shedding - hanging on to winter coat longer than other horses → failure to shed coat. Changes in hair coat - often starting with shaggy hair on the legs/face/neck or changes in coat colour → long curly coat that fails to shed (hirsutism/hypertrichosis). Hirsutism is diagnostic of PPID, but is not apparent in the early stages of the disease. See Hirsutism p 98. Muscle loss/atrophy, particularly along the topline; weight loss/ribs visible but pot-bellied appearance - Cathy McGowan BI webinar 04 Sept 2012 said muscle loss and pot belly may be the first signs to be noticed. Often easy keeper becomes hard to keep weight on with no change in management. See Muscle Atrophy p 98. *Laminitis - often first noticed in the autumn (August - October) or occurring later in life for the first time → laminitis any time of year. NB clinical signs of laminitis due to PPID can be subtle, possibly because high levels of beta-endorphin lead to high pain tolerance, so "foot-soreness" rather than obvious laminitis may be noticed. See Laminitis p 98. *Insulin resistance - hyperinsulinemia (fasting insulin > 20 µIU/ml). See Abnormal Fat Distribution and Insulin Resistance p 99. *Regional adiposity (fat pads) - particularly above and around the eyes (supraorbital fossa), along the crest of the neck, above the tail and in the sheath/mammary region. Eyes often mucky/tearing, sheath often mucky and leaving black smegma on inside of hind thighs. See Abnormal Fat Distribution and Insulin Resistance p 99. Excessive sweating (hyperhidrosis) - often patchy sweating, often on stomach or just one side. NB failure to sweat (anhidrosis) is sometimes seen. See Hyperhidrosis p 99. Increased drinking and urination (polyuria/polydipsia - PU/PD) - usually first noticed as increased wet bedding when mucking out. See PU/PD p 99. Frequent/chronic infections, e.g. sinusitis, hoof abscesses, skin problems, pneumonia, and wounds may appear slow to heal. Development of allergies and hypersensitivities e.g. to vaccinations, insect bites. See Opportunistic Infections and Immunosuppression p 99. Abnormal seasons/infertility in mares. See Reproductive Infertility p 100. Eventually neurological disorders e.g. blindness, ataxia, seizures, narcolepsy. See Neurologic Disease p 100. See the Equine Endocrinology Group's Recommendations for the Diagnosis and Treatment of Pituitary Pars Intermedia Dysfunction (PPID) 2015. ​The diagnosis of PPID is not straightforward. The slow progressive neurodegeneration means that the horse is likely to be ill before blood tests confirm PPID, and our lack of understanding of the disease makes it difficult to validate existing or potential diagnostic tests. Comparing current blood test results to histological changes in the pituitary gland has shown that mild and moderate (grade 3 and 4) changes are often present in the pituitary gland before blood tests become positive. Early symptoms often go unnoticed, and vary greatly between horses. A positive blood test appears to be diagnostic of PPID (if seasonally adjusted reference ranges are used), but a negative blood test does not necessarily mean that the horse does not have PPID. Although laboratories set cut-off values for diagnosing PPID, there may be a grey area either side of the cut-off value, and the clinical symptoms must always be considered along with the diagnostic test results. For advanced cases of PPID the clinical signs and presence of hirsutism (long curly coat which sheds abnormally) can be sufficient for a diagnosis. However hirsutism is often one of the last signs to appear. 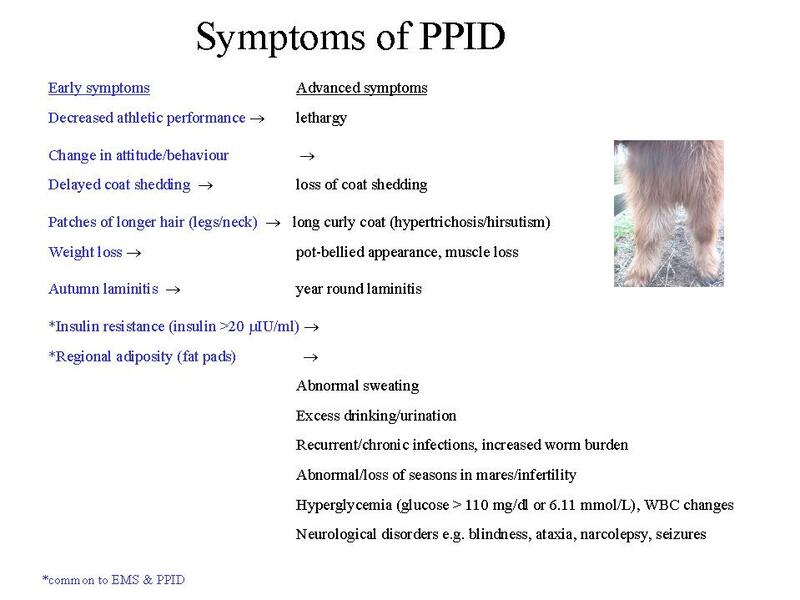 Dianne McFarlane has suggested that PPID is a clinical syndrome of different causes, therefore it is unlikely that one testing method will be best in all cases (source: Vet Clin North Am Equine Pract. 2011 Apr;27(1):93-113 Equine pituitary pars intermedia dysfunction McFarlane D). ACTH test (resting plasma ACTH concentration) - no risk of laminitis, advisable for monitoring pergolide dosage, single vet visit and blood draw, can be used at any time of the day and year and is the only reliable test during the autumn seasonal rise (if a seasonally adjusted reference range is used). Dexamethasone Suppression Test (DST) - possible risk of laminitis, doesn't specifically measure ACTH reduction due to pergolide, more expensive as requires two vet visits (unless the owner administers the dexamethasone), cannot be used during the autumn seasonal rise. The TRH stimulation test, testing ACTH (not cortisol), may be useful when ACTH or DST results are borderline or unexpected (i.e. if a horse with physical symptoms tests negative for PPID). ACTH is tested before and soon (10 mins or 30 mins) after injecting 1mg TRH. Retesting resting ACTH during the seasonal rise (August - October northern hemisphere) may be just as useful. General protocols for testing. Check protocols with the laboratory being used. Collect sample into EDTA (purple-top) tube any time of day or year. No need to fast horse beforehand. Stress e.g. from travelling and exercise should be avoided beforehand. Chill sample within 3 hours (ideally immediately). Separate plasma before sending to the lab by centrifugation or by gravity (ideally within 8 hours of collection). Chill en-route to lab using overnight delivery. Freezing is unnecessary but can be done, and may be beneficial if delivery of the blood is delayed. Some laboratories (e.g. Liphook Equine Hospital) will provide a chiller pack for posting ACTH samples. Diagnosis of PPID: laboratory reference ranges should be used, but should be similar to Liphook's seasonally adjusted reference range of > 29 pg/ml November to July or > 47 pg/ml August to October, or Cornell's non-seasonally adjusted reference range of > 35 pg/ml (where chemiluminescent assay is used - radioimmunoassay generally gives a slightly lower result). The higher the ACTH concentration above normal, the more likely the diagnosis of PPID..
NB As ACTH secretion is pulsatile, some vets recommend taking 2 blood samples (10-15 minutes apart) and combining them (or submitting both samples) to increase the sensitivity of the ACTH test. 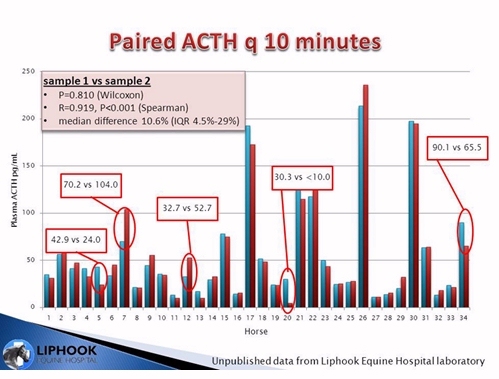 Liphook tested ACTH samples taken 10 minutes apart from 34 horses. Most horses didn't have a significant difference between results, and the median difference was 10.6% (the mean intra-assay CV was 5.1%). However approx. 15% of the horses tested did have a significant variance between test results, although not necessarily the difference between a positive or negative diagnosis. Administer 40 µg/kg bodyweight dexamethasone I.M. or I.V. (20 mg for a 500 kg horse) (this can be administered I.M. by the owner to save a vet visit). Collect blood into a dry tube 19 hours later and test for cortisol. Glucose - horses with PPID may have glucose concentrations above the normal range (hyperglycaemia). Insulin - horses with uncontrolled PPID will often have insulin concentrations above the normal range (hyperinsulinaemia/insulin resistance). "Basal ACTH is the best option for a basal diagnostic test." Can testing for PPID be done in the autumn during the "seasonal rise"? Yes, definitely - in fact according to Liphook this may be the best time to test - "it is apparent that testing in the autumn may actually allow the greatest differentiation between PPID cases from normal horses and there is no reason at all to avoid testing for PPID in the autumn." 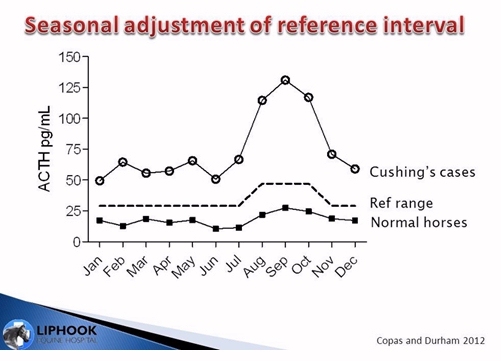 Obviously accurate interpretation of the results depends on applying properly derived and calculated seasonally adjusted reference ranges (which accompany all laboratory results from The Liphook Equine Hospital Laboratory), as ALL horses show an increase in ACTH during the autumn months (usually August to October). However seasonally adjusted references ranges local to the horse should be used. Whilst Liphook have set their autumn cut off at 47 pg/ml (and 29 pg/ml the rest of the year), in Queensland, Australia 77.4 pg/ml is the autumn cut off being used (and 29.7 pg/ml the rest of the year) (however this has been verified against a gold standard of hirsutism plus 3 other clinical signs of PPID and therefore may only pick up advanced cases?). Are the blood tests for PPID 100% accurate? No - none of the laboratory tests for PPID are 100% accurate, and there is currently no reliable test for detecting PPID in the early stages. Clinical signs should always be considered as well as laboratory results. - a TRH stimulation test, testing ACTH, could be carried out (but probably not during the seasonal rise). What can cause a false negative result? ACTH appears to be secreted in a pulsatile rather than a constant fashion, therefore a single blood collection may miss a pulse and the ACTH concentration may be lower than it would have been a few minutes later. Several blood collections, either tested separately or combined, may be more accurate. Mishandling of the blood can cause ACTH to degrade - the sampling protocol recommend by the laboratory must be followed exactly. Samples taken during the seasonal rise (usually August to October northern hemisphere) must be interpreted according to seasonally adjusted reference ranges, otherwise a healthy horse could be falsely diagnosed as having PPID. Cornell's AHDC suggests that normal horses can have up to 3 times the normal concentration of ACTH during the seasonal rise, and horses with PPID tend to have more than 3 times the normal concentration. Liphook suggests that ACTH concentrations above 47 pg/ml are diagnostic of PPID from August to October, and above 29 pg/ml the rest of the year. Pain, illness, stress and exercise can increase plasma concentrations of ACTH, and horses should not be exercised or stressed (which may rule out travelling) before blood is collected. However some vets claim that results do not appear to be greatly affected in most horses unless the pain/stress is considerable. Freezing the blood sample before it has been separated by centrifuge can cause high ACTH results. Blood must not be frozen before it has been separated by centrifugation. If it is separated by gravity, it mustn't be frozen at all. In fact - just forget about measuring cortisol to diagnose PPID! What is the difference between the diagnosis of PPID and EMS? PPID and EMS do share some clinical symptoms (e.g. regional adiposity, increased appetite, laminitis) particularly as many horses with PPID also have insulin resistance/hyperinsulinemia. Increased insulin could be either PPID or EMS. Increased glucose is more likely to be PPID. Pergolide, a dopamine agonist, is the drug most vets prescribe to control PPID. Pergolide acts to replace the dopamine missing in horses with PPID, inhibiting the over-production and release of the POMC-derived hormones, α-MSH, β-endorphin, CLIP and ACTH. In the UK, Pergolide is now licenced for horses as Prascend. Under the cascade system, horses newly diagnosed with PPID can only be prescribed pergolide as Prascend. Horses already being prescribed pergolide before Prascend was licenced may be able to continue being prescribed generic pergolide whilst this can still be bought from pharmacies. What dose of Pergolide should be used? The correct dose of Pergolide is the lowest effective dose - i.e. as little as possible, but as much as necessary to control the clinical symptoms and ACTH (plus perhaps also insulin, other POMC-derived hormones and glucose) concentrations. Different horses need different doses. Most horses start on 1 mg - 1.5/2 mg per day (ponies 0.5 mg - 1 mg), but some horses need 7mg - 8mg per day to control their symptoms, rising to 10mg per day during the seasonal rise (anecdotal). Boehringer Ingelheim, the manufacturer of Prascend, recommends a starting dose of 2 µg/kg bodyweight, so 0.5 mg for a 250 kg pony, 1 mg for a 500 kg horse, and despite anecdotal evidence of higher doses being given with no reported side effects, states that the maximum dose is 10 µg/kg, or 5 mg for a 500 kg horse. This may be because there is currently no published research using doses higher than 5 mg for a 500 kg horse. PPID is a progressive disease, and the amount of Pergolide required to control the symptoms is likely to increase as the horse ages. Some horses only need Pergolide during the seasonal rise in the early stages of the disease. Many horses need an increased dose of Pergolide during the seasonal rise. Are there any side effects of using Pergolide? "Potential adverse reactions in horses include inappetence, transient anorexia and lethargy, mild central nervous system signs (e.g., mild depression and mild ataxia), diarrhoea and colic. If signs of dose intolerance develop, treatment should be stopped for 2-3 days and then reinstituted at one-half of the previous dose. The total daily dose may be then be titrated back up until the desired clinical effect is achieved, increasing in 0.5 mg increments every 2-4 weeks." As loss of appetite and/or depression appear to be quite common when first starting pergolide, the ECIR Group recommends always titrating up to the initially prescribed dose. See Pergolide (ECIR horse) for more information about tapering the starting dose, and ideas for how to get your horse to take its pergolide. Most cases of inappetance occur during the first month of treatment, often during the first few days and even within 24 hours (if it occurs at all). Loss of appetite can be a serious consequence for very overweight or pregnant ponies because of the risk of developing hyperlipaemia. Is Pergolide treatment always effective? Usually, yes. It can be a case of playing around with the dose to get a reduction in clinical symptoms and/or ACTH levels. However Divers (2008) says that not all horses respond to pergolide, showing no clinical or laboratory response even with doses as high as 5 mg.
Can Vitex Agnus Castus/Chastetree Berry be used to treat PPID? See Vitex Agnus Castus. Although Vitex Agnus Castus appears to have dopaminergic effects on prolactin, and horses in trials have shown a lifting of depression, there is no published research indicating that Vitex Agnus Castus reduces ACTH or insulin levels..
How soon after starting Pergolide can follow-up blood testing be carried out? ACTH levels can be rechecked as early as 7 days after starting treatment with Pergolide. Liphook found that of the horses that showed an improvement in their ACTH concentrations on 1.5 mg Pergolide once a day, between approximately 52% and 72% showed an improvement within 7 days, 62% to 82% showed an improvement within 14 days, and between 74% and 96% showed an improvement within 4 weeks. So a reduction in ACTH levels may be seen within 7 days, and should be seen within 2 - 4 weeks of starting Pergolide (allowing for correct dose, effects of the seasonal rise, etc). Not all horses with PPID will be at higher risk of endocrinopathic laminitis (although it is probably safest to assume any horse with PPID does have a higher risk of laminitis until proven otherwise). As many horses are first diagnosed with PPID because they have laminitis, figures showing the incidence of laminitis in horses with PPID may not be truly representative. Whether or not a horse with PPID is at higher risk of endocrinopathic laminitis depends on whether the horse has insulin dysregulation, and therefore insulin resistance and/or hyperinsulinaemia - it is high levels of insulin that causes endocrinopathic laminitis, and it is assessing insulin dysregulation that indicates laminitis risk. ACTH and other tests for PPID have no relationship with laminitis risk, therefore any horse suspected of having or diagnosed with PPID should have both ACTH and insulin tested. "The pars intermedia of the pituitary gland, and plasma ACTH and cortisol levels in the pony, which was first diagnosed in Japan as indicating equine Cushing's disease, were examined by immunohistochemistry and radioimmunoassay, respectively. The pars intermedia was greatly enlarged and most of its cells were immunoreactive for antisera to both adenocorticotropic hormone (ACTH) and beta-endorphin (beta-End). The plasma ACTH level was elevated when clinical symptoms appeared. The present results reveal that equine Cushing's disease in this pony was induced by the hypersecretion of ACTH and beta-End from the enlarged pars intermedia of the pituitary gland."